Illustration 123 in a row. Woke up feeling rather gloomy today. It was raining and icky outside too, the weather kinda matched my mood I guess. Was chatting to someone who seems to see nothing but my flaws and it saddens me and it's hard not to take it personally and the best thing I can do here is walk away for the moment. Not really my style I admit. I would rather end things permanently or repair a situation immediately, but I can't always do that. People are complicated beings. 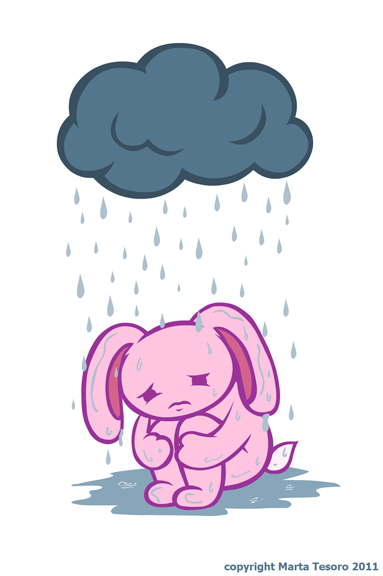 brilliantly sad bunny, but sorry to hear it actually reflects your day! DD: i'll send many toughts n wishes for your day to brighten! I know what you mean, it can be so frustrading... And today I feel like your bunny: I have a cold and feeling sick, I hate that! The illustration fits into my mood! Critical and negative people with their poisonous words can leave one feeling so drained, sad, hopeless...on the other hand, helpful, discerning, and positive words from a true friend leave you feeling uplifted and better for it, havng actually learned something worth learning about oneself. Some people need some serious training in this area...and do much heart & soul damage because they choose not to and stay lacking. So please try not to let your bunny heart be troubled by them, and focus on the good and best that you know it the truth that lives in YOU!